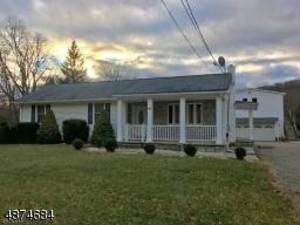 GREAT FOR THE SMALL CONTRACTOR OR A PROFESSIONAL OFFICE SPACE ABOVE GARAGE, LIVE IN MAIN HOUSE OR LEASE BOTH STRUCTURES, HOME HAS A FINISHED BASEMENT WITH A IN-LAW APARTMENT AND SEPARATE ENTRY COMMERCIAL ZONED AND CONVENIENTLY LOCATED HOME JUST OFF ROUTE 80, NEAR RT. 23, MORRIS COUNTY CLOSE TO SUSSEX AND PASSAIC CREATING A GREAT CENTRALIZED LOCATION FOR A CONTRACTOR, LANDSCAPER OR A SERVICE PROFESSIONAL. BUILDINGS HAVE BEEN ALL UPDATED IN 2010, HOME HAS C-AIR, PELLA WINDOWS, ALL WOOD FLOORS, NEWER KITCHEN, 3 BEDROOMS NEWER CUSTOM FULL BATH ON FIRST FLOOR, FULL FINISHED BASEMENT WITH IN-LAW APARTMENT, DUAL ENTRY. A MUST SEE. OVERSIZED DETACHED GARAGE HAS A FULL SECOND FLOOR THAT CAN BE BUILT OUT, THE GARAGE HAS A WATER HOOK UP ALL READY IF BUYER CHOOSES TO USE IT.